Step 1: Firstly, you have to download the Calibre software and install it in your computer. There is more availability and versions for all operating system. Choose the one which you require. 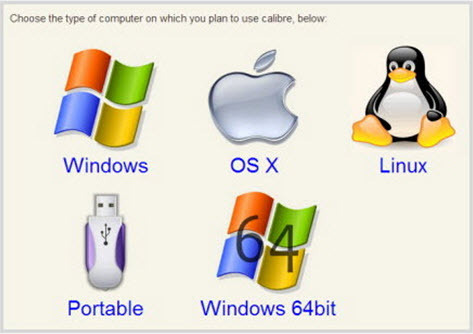 Step 2: Open the downloaded Calibre software and you have many options at the top of window. Choose the "Add books" option and add the book which you want to convert. Once if you added then you can see the book name in the middle box. Step 3: Just click the book and again tap the "Convert books" present at the top of window. Step 4: After clicking the convert books option, you will get the pop-up window. Now, you have to select the output as PDF and confirm it by clicking "OK" button. Step 5: The conversion process takes place and in meantime you can confirm it by viewing the message bar "Job 1". It means you have started one conversion process. Once if the conversion completed then you will be notified by "Job 0". Step 6: After the conversion process have finished, your files will be stored at the main interface with .PDF extension. If still you couldn't find then you will be displayed with the small window denoting the author name, format changes and click to open options etc. Step 7: Select the "Click to open" option and you will get the file disk. You can save the file wherever you want. Note: It is easy to use and with simple steps you are authorized for conversion. In this part, we are going to discuss about one-stop solution for all your PDF files in easy manner. This tool was preferred commonly in all organizations and individuals. It is designed not for professional users alone but for all non-technology minded users too. The one and only software is called as PDFelement ProPDFelement Pro. Using this software, you can easily convert EPUB to PDF within 2 or 3 steps. If you use the Kindle or other devices to read the eBook then it won't support the EPUB file extension. In this case, you definitely have to convert using EPUB PDF converter Mac. Not only has it supported the conversion process but also it has the main configuration process to create the PDF files. You can create and convert the PDF files from the file extensions such as EPUB, Webpage, HTML and image fonts etc. You have the eligibility to convert EPUB to PDF on Mac and combine many PDF files to one PDF files. It also provides the power controls to your PDF file such as annotate, add, watermark and delete the PDF files. For your consideration, we have listed out the features of PDFelement Pro. You have the choice to convert EPUB to PDF on Mac or PDF to word, excel and images. You have various PDF editing tools to combine, add or to delete the PDF files. You have the prior setup with OCR functions and scanning PDF functions. You can markup and annotate the PDF files. You have the rights to protect the password, digital signature and watermark your PDF files. EPUB is the main file extension for eBooks. This extension is very popular among the eBook readers and it has the standard authorizations. It nearly gives more supports to hardware readers of eBooks. The latest version of EPUB is EPUB 3.1 which is highly embedded and interactive stability in videos and audios. Using EPUB, you can modify the original format as per your requirement such as resizing the screen size and font size. Using PDF, you cannot modify the original format since it is not flow able to edit font size and screen size. EPUB is HTML based open source format. PDF is not HTML format but it is also open source format. EPUB is used as the only reading software and you are not provided with functions to edit. PDF is used to create the file, annotate, highlights and notes taking etc using the Adobe Acrobat. EPUB is standardized openly and works on various platforms like Mac OS, Microsoft windows and Linux. PDF is also open standard and works on all platforms. EPUB is not popular in internet because it was well-known only to eBook readers. PDF is more popular because nearly 150 million files were available to all users in internet. Using EPUB, you cannot rely on security actions since it's just a HTML format. Using PDF, you can set the password, digital signature and watermark etc.